Qutab Minar, the 239ft sandstone tower is an Indo-Islamic architectural wonder of ancient India. This magnificent tower of victory stands in the Qutab Complex located at Aurabindo Marg, near Mehrauli, 14 Km south of Connaught place in Delhi. The complex has a number of other important monuments- the gateway built in 1310, the Alai Darwaza, Quwwat-ul-Islam Mosque; one of the oldest existing mosques in India, the tombs of Altamish, Alauddin Khalji and Imam Zamin; the 2000 year old 7m high Iron Pillar- the Alai Minar; another tower 27m high, the Madrasa or School, great screen of Qutbuddin Aibak in the mosque etc. King Qutubuddin Aibak of Slave dynasty laid the foundation of the Qutab Minar in 1199, adjoining the Quwwat-ul-Islam mosque, to proclaim the victory of Islam, after the defeat of the last Hindu kingdom in Delhi. It was the Afghan, Muhammad of Ghur who ousted the last Hindu king Prithviraj Chauhan in AD 1192, but he returned to his country leaving Qutbuddin Aibak as his viceroy. In 1206, on his masters death, Aibak crowned himself as the Sultan of Delhi. The word 'Qutab Minar' means 'axis minaret'. The tower which dominates the countryside for miles around has five storeys, each marked by a projecting balcony. The tower was built in three stages. Qutab-ud-Din completed the first storey. Second, third and the fourth were completed by his successor and son-in -law, Illtutmish in 1230. The minar was first struck by lightening in AD 1368 and the fallen top storey was replaced by two storeys's, the fourth and the fifth in 1370 AD by Feroz Shah Tughlaq (AD 1351-88). Qutab Minar with a height of 72.5m (239ft), is the highest stone tower in India and has a diametre of 14.32 metres at the base and about 2.75 metres at the top. The first three storeys are made of red sandstone and are heavily indented with different styles of fluting, alternately round and angular on the bottom floor, round on the second and angular on the third. The fourth and fifth floors are made of marble and sandstone. The decoration of the Qutab Minar is consistently Islamic in character from base to top; though the somewhat hybrid style of Firoz Shah's later additions is noticeably distinct. 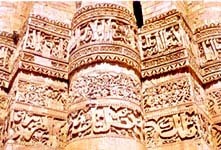 Numerous inscriptions in Arabic and Nagari characters are seen as wide encircling bands in the plain fluted masonry of the Minar. This inscriptions reveal the history of Qutub, from its commencement in AD1199 to its repairs in between. There is a door on the northern side, leading inside the tower to a spiral stairway with 379 steps that winds its way up to the balcony in each floor and culminating in a platform at the top. The intricate balconies held together by stalactite vaulting technique and patterned with honey combing is a special feature of the minar. The minar has survived a series of lightening bolts and earthquakes during the past centuries. After the first lighting strike way back in AD1368 knocking off the top storey and two floors replaced instead, by Firoz Shah Tuglaq, inscriptions indicate that further repairs were done by Sultan Sikander Lodi in 1503. Later in 1803, the cupola on the top was thrown down and the whole pillar was seriously injured by an earthquake. It was repaired by Major R. Smith of the Royal Engineers who restored the Qutub Minar in 1829 replacing the cupola with a Bengal style chhattri. The chhattri was removed in 1848, by the Viceroy Lord Hardinge as it was criticized as not keeping in with the architectural style of the rest of the minar. Now it stands to the left of the entry path and is known as Smith's folly. Today, this impressively ornate tower has a slight tilt, but otherwise has worn the centuries remarkably well. The staircase inside the tower to the balconies has been closed following an accident in early 1980's when a party of school girls panicked when the lights failed and a stampede led to a number of deaths.